Study implicates two genes in the cause of schizophrenia, vital for signalling balance. In the mammalian central nervous system, neurons receive inhibitory synaptic inputs from gamma-aminobutyric acid (GABA)ergic interneurons and excitatory inputs from glutamatergic neurons. Evidence suggests that the dysfunction of appropriate GABAergic inhibition and the consequent imbalance between excitation and inhibition in the cerebral cortex underlie the cause of schizophrenia. Now, a study from researchers at Duke-NUS Graduate Medical School Singapore (Duke-NUS) has linked the abnormal behaviour of two genes (BDNF and DTNBP1) to the underlying cause of schizophrenia. The team state that these findings have provided a new target for schizophrenia treatment. The opensource study is published in the journal Biological Psychiatry. Previous studies show that Schizophrenia is a devastating mental disorder that affects nearly 1% of the total human population. The dominant cause of the disorder lies in impaired brain development that eventually leads to imbalanced signals within the brain. This imbalance within the brain is thought to cause hallucinations and paranoia in people with schizophrenia. The lab state that while the two genes DTNBP1 and BDNF have been singled out as risk genes for schizophrenia in studies before, theirs is the first study to show that the two function together. They go on to add that pinpointing the importance of the abnormal delivery of BDNF has shed considerable insight into how the brain network develops; and presents possibilities for potential treatments for schizophrenia designed around enhancing BDNF levels. The current study analysed signalling activity in neuronal cultures that either did not have the DTNBP1 gene or had lowered levels of the gene, because reduced DTNBP1 levels and genetic disruptions of DTNBP1 in mice resulted in schizophrenia-like behaviours. Results showed that the low levels of DTNBP1 resulted in dysfunctional interneurons and over-activated neuronal network activity. Data findings also showed that reducing levels of DTNBP1 lowered the levels of the secreted protein molecule, BDNF. The team explain that they have shown that BDNF is one of the most important factors that regulate the development of a normal brain circuit. It plays an important role in the interneurons ability to connect to the brain with interneurons receiving BDNF via a transport system run by DTNBP1. The lab conclude that without BDNF, the abnormal circuit development and brain network activity observed in schizophrenia patients results. The researchers surmise their findings show that when BDNF levels were restored, brain development and activity were rescued and returned to more normal levels, despite the absence of DTNBP1. For the future the team plans to test if these findings are viable in an animal model, if so, this could mean that correcting the imbalance within the brain circuits of schizophrenia patients may bring the global medical communtiy closer to producing a treatment. 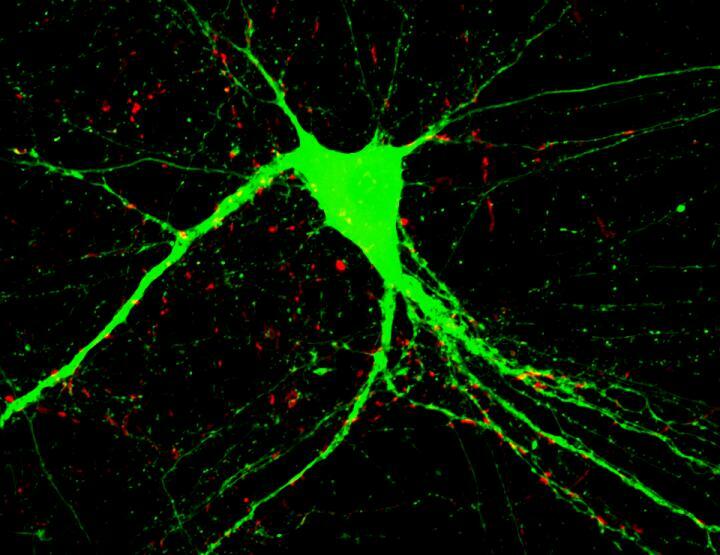 This is an image of a cultured neuron with an added BDNF protein. Credit: Duke-NUS Graduate Medical School Singapore.